SPECIAL DELIVERY: Goodison 'grounds' her latest collection in the personal and the political. STILL super-productive and at the height of her creative powers, Lorna Goodison continues to accomplish firsts in her illustrious literary career. Coming on the heels of her massive Collected Poems, the multi-prize-winning scribe has dropped her debut essay collection, the curiously titled Redemption Ground: Essays and Adventures, adding to an estimable and celebrated body of work that spans a dozen poetry anthologies, short-story collections and an acclaimed memoir, From Harvey River. 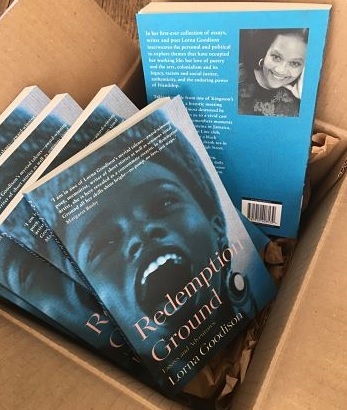 Published by Myriad Editions, Redemption Ground finds Goodison interweaving the person and the political to explore themes that have captured her working life. “They are essays and adventures about poetry and my relationship with poetry and things that have happened to me as I’ve travelled,” the reigning poet laureate has said about the 224-page collection. Specifically, she zones in on her love of the written word and the arts, even as she examines such subjects as colonialism and its legacy, racism and social justice and the enduring power of friendship. What’s more, the author introduces readers to a vivid cast of characters and places, including a now-defunct Jamaican cinema, New York’s Bottom Line Club and a fascinating Black hairdresser in Paris. The book’s title, interestingly, is borrowed from one of the oldest markets in Kingston, Jamaica. >> More Books: Marguerite Orane publishes Forget It: What’s the Point?